If you need something bigger than an Equinox but not as massive as a Suburban, the TrailBlazer will probably fit well into your life (as well as your garage). It has good front- and rear-seat legroom, lots of headroom and a fair amount of cargo space. The most important thing about our Chevy trailblazer is that it is safe. The Chevy trailblazer has an automatic rear view mirrors and every time you reverse the mirror moves down so that you can parallel park easier however, I have had to replace the wiring because the mirror has stopped functioning properly so a random times while driving the mirror will move itself therefore the mirror becomes a hazard and makes it unsafe to drive. Other than that little inconvenience I love the Chevy trailblazer, it has great freeway gas mileage and a very roomy and comfortable feel all around the car. It is out go to vehicle for road trips, makes moving trips easier, and can also tow a boat or trailer if needs. I would recommend this car for families and outdoor adventures. Reliable, good value, looks sporty and decent even though its a 2007. 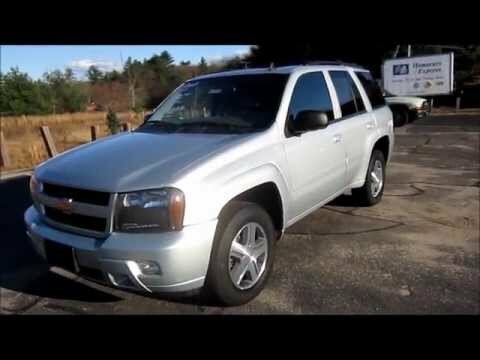 2007 Chevy trailblazer bought used and has original engine. No rust and sits outside year round. Low mileage 15-18 miles to the gallon. Uses unleaded gasoline. Spacious in back seat, my husband is 6ft 5in and can sit comfortably in back seat. Heated seat warmer on door panel--this is problematic because I constantly bump it and turn on easily. Good stereo sound with factory installed system. Has gas and brake pedals that adjust to leg length. I do not like the cup holders that are behind console gear shift. Makes it difficult to have drinks bigger than 12-16oz cups. Back seat windows go all the way down. Has child safety locks. OnStar system available. Sirius system available. Comfortable to drive with plenty of room for family or hauling items. Problem: check engine light constantly comes on. We've fixed all issues known but the light has not went off. Other than that, I love the comfort and my room for my family whether traveling or hauling many large items. The seats (except front) are removable which I absolutely love. Good highway gas mileage as long as the maintenance is kept up to date. Tow hitch included which has came in handy. It looks and feels great to drive. Very dependable. General Motors LLC (GM) is recalling certain model year 2005-2007 SAAB 9-7x; 2006 Chevrolet Trailblazer EXT and GMC Envoy XL; and 2006-2007 Chevrolet Trailblazer, GMC Envoy, Buick Rainier and Isuzu Ascender vehicles. Fluid may enter the driver's door master power window switch module, causing corrosion that could result in a short in the circuit board. A short may cause the power door lock and power window switches to function intermittently or become inoperative. The short may also cause overheating, which could melt components of the door module, producing odor, smoke, or a fire. A short in the circuit board could lead to a fire, increasing the risk of personal injury. A fire could occur even while the vehicle is not in use. As a precaution, owners are advised to park outside until the remedy has been made. GM will notify owners, and dealers will inspect the part number on the door module, and install a new door module if necessary, free of charge. Parts for the remedy are not currently available. GM will send an interim letter to owners in late August 2014. A second owner letter will be mailed when parts are available. Owners may contact GM customer service at 1-800-521-7300 (Buick), 1-800-222-1020 (Chevrolet), 1-800-462-8782 (GMC), 1-800-955-9007 (SAAB), and 1-800-255-6727 (Isuzu). GM's number for this recall is 14309. NOTE: This recall provides a new remedy for all vehicles covered by recall 13V-248. Vehicles whose modules were modified but not replaced as part of the previous recall remedy must have their vehicles remedied again under this campaign.